Equipo Nizkor - US transfers 9 Yemeni detainees from Guantanamo to Saudi Arabia. The Department of Defense (DOD) announced on Apr. 16 that nine Guantanamo detainees, all from Yemen, have been transferred to Saudi Arabia. The transferred detainees include a man who was allegedly one of Osama bin Laden's bodyguards, the brother of al Qaeda in the Arabian Peninsula's (AQAP) current emir, and a jihadist the Obama administration determined was "too dangerous to transfer but not feasible for prosecution." Intelligence included in declassified and leaked files links all nine of them to al Qaeda's network in 2001 or beforehand. The DOD says that eight of the nine detainees "were unanimously approved for transfer by the six departments and agencies comprising" President Obama's Guantanamo Review Task Force, which concluded its work in January 2010. But the reality is more complicated. The task force placed six of the now former detainees in "conditional detention" at Guantanamo. The six Yemenis could be transferred, Obama's interagency body found, but only under certain conditions. Just two of the men — Mohammed Abdullah al Hamiri and Mansoor Muhammed Ali Qattaa — were approved for outright transfer to a country "that will implement appropriate security measures." Prior to the task force being established in Jan. 2009, Joint Task Force - Guantanamo (JTF-GTMO), which oversees the detention facility, assessed both Hamiri and Qattaa to be "medium" risks who "may pose a threat to the US, its interests, and allies." JTF-GTMO also recommended that both of them be transferred out of the DOD's custody. Hamiri reportedly received training at al Qaeda's Al Farouq camp and "participated in hostilities against US and Coalition forces" in late 2001. JTF-GTMO concluded that Qattaa was an "Islamic extremist and probable member of al Qaeda who traveled to Afghanistan for jihad shortly after" Sept. 11, 2001. Qattaa was captured on Feb. 7, 2002 in a Karachi, Pakistan safe house operated by a senior al Qaeda facilitator known as "Riyadh the Facilitator" (a.k.a. Sharqawi Abdu Ali al-Hajj). The task force explained in its January 2010 report that 30 Yemenis, including six of the men transferred to Saudi Arabia on Apr. 16, were placed in "conditional detention." These men could be transferred if the "security situation improves in Yemen," "an appropriate rehabilitation program becomes available," or "an appropriate third-country resettlement option becomes available." The task force considered the Yemenis placed in "conditional detention" to be a lower risk than the detainees slated for indefinite detention, but they were also thought to be more of a threat than the Yemenis approved for outright transfer. Even if one of these three security conditions was "satisfied," the task force said, the Yemenis "approved for transfer would receive priority for any transfer options over the 30 Yemeni detainees approved for conditional detention." In the years since the task force completed its work, most of the Yemenis who were approved for transfer have been resettled in other countries. However, the security conditions in Yemen have hardly improved. In fact, AQAP has taken advantage of a multi-sided war to seize a large amount of territory along Yemen's southern coast. This is one reason why Saudi Arabia was chosen as a destination for the men. JTF-GTMO evaluated all six "conditional" detainees prior to President Obama's task force being established in Jan. 2009. JTF-GTMO found that three of them — Ahmed Umar Abdullah al Hikimi, Tariq Ali Abdullah Ba Odah (who became well-known for his prolonged hunger strike) and Ahmed Yaslam Said Kuman — were "high" risks who are "likely to pose a threat to the US, its interests, and allies." All three of them allegedly served in Osama bin Laden's 55th Arab Brigade, which fought alongside the Taliban in pre-9/11 Afghanistan, and also participated in the Battle of Tora Bora in late 2001. A leaked JTF-GTMO threat assessment for al Hikimi, dated June 2, 2008, notes that he was captured in mid-2001 as part of a group the US intelligence community has dubbed the "Dirty 30." American intelligence analysts found that most members of the "Dirty 30," who were fleeing the Tora Bora Mountains in Afghanistan when they were captured along the border with Pakistan, were either bin Laden's bodyguards or part of the al Qaeda master's security detail. One member of the "Dirty 30" was Mohammed al Qahtani, who was recruited to take part in the 9/11 hijackings before being denied entry into the US in the summer of 2001. JTF-GTMO found that al Hikimi himself was a bodyguard for bin Laden. The threat assessment for al Hikimi includes this warning: "Detainee continues to demonstrate extremist behavior at JTF-GTMO and is likely to reestablish his membership [in] al Qaeda if released." Three others placed in "conditional detention" by the task force prior to being transferred to Saudi Arabia were deemed "medium" risks by JTF-GTMO, which concluded that they "may pose a threat to the US, its interests, and allies." One of them is Ali Yahya Mahdi al Raymi, the brother of AQAP's current emir, Qasim al Raymi. The second is Abdul Rahman Mohamed Saleh Naser, who was allegedly recruited by Sheikh Abdul Majid al Zindani and belonged to bin Laden's 55th Arab Brigade. Zindani was long allied with bin Laden and remains an influential jihadist in Yemen. As of late 2013, according to the US Treasury Department, Zindani continued to provide "guidance" to AQAP. JTF-GTMO's leaked threat assessment for Naser notes that he has been a "high" risk from a health perspective, as he has participated in hunger strikes and had other health problems. JTF-GTMO recommended years ago that both Naser and al Raymi be transferred. The same is true for Abdul Rahman Umir al Qyati, who was recommended for transfer in September 2004. JTF-GTMO's analysts found that Qyati was likely trained at al Qaeda's Al Farouq camp, where he purportedly received some basic weapons training. 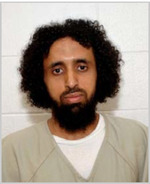 President Obama's task force recommended that Mashur Abdallah Muqbil Ahmed al Sabri be held in continued detention under the 2001 AUMF because he was "too dangerous" to release. JTF-GTMO previously determined that he was a "high" risk detainee and recommended that he remain in DOD custody. Sabri also had his petition for a writ of habeas corpus denied by a DC district court in February 2011. The court found that Sabri "traveled from Yemen to Afghanistan in 2000" to fight alongside the Taliban and al Qaeda, "stayed in Taliban and al Qaeda guesthouses," "sought out and received military-style training from the Taliban or al Qaeda," and "traveled to the battle lines in Afghanistan as part of the Taliban or al Qaeda and remained part of those forces at the time of his capture in early 2002." The US government presented overwhelming evidence against Sabri, including documents recovered in Afghanistan. One such document was Sabri's application for an al Qaeda training camp. After completing his training, the application notes, Sabri planned on waging "jihad." The government also introduced into evidence a 92-page collection of documents recovered from the "Director of Al Qaeda Security Training Office." Those documents contain the "names of the students admitted to" various training programs. Sabri is mentioned more than once in the documents, which list him as a graduate of an anti-aircraft missiles class. In April 2012, an appellate court upheld the district court's rejection of Sabri's habeas petition. Sabri's counsel challenged the government's evidence showing he had received anti-aircraft training. But the appellate court ruled that "the district court did not clearly err in finding that the documents refer to" Sabri. The appellate court also cited much other evidence demonstrating Sabri's ties to al Qaeda's network inside Afghanistan. Three years after the appellate court's decision, in April 2015, a Periodic Review Board (PRB) approved Sabri's transfer, finding that "continued law of war detention of the detainee is no longer necessary to protect against a continuing significant threat to the security of the United States." The PRB "considered" Sabri's "low level of training, renunciation of extremist ideology, and lack of a leadership position in al Qaeda or the Taliban." It is not clear why there is a discrepancy in how Sabri's training was described by the PRB as compared to the earlier court rulings. Anti-aircraft training is not "low level." Sabri knew at least one of the suicide bombers responsible for the October 2000 bombing of the USS Cole. JTF-GTMO's leaked threat assessment ties Sabri to the al Qaeda operatives who carried out the bombing. But the US government argued during his PRB hearing that there is "no indication" he "had foreknowledge of the attack." This document has been published on 02May16 by the Equipo Nizkor and Derechos Human Rights. In accordance with Title 17 U.S.C. Section 107, this material is distributed without profit to those who have expressed a prior interest in receiving the included information for research and educational purposes.